1. In a saucepan heat olive oil, add in the rice and mix well. 2. Then the rice, pour boiling water so that water covers it (about 2 cm), season to taste with salt, put on low heat until the water has completely evaporated. 3. Clean the garlic from the skins, cut each clove into 2 halves. 4. Add the garlic to the rice, stir, cover, and adding 100 ml of water, simmer for 7-10 minutes. 5. Chicken fillet cut into small pieces. 6. Carrots to grate on a coarse grater. 7. Pan with oil heat on the stove. Send her carrots and chicken. Fry for 10 minutes, then allow to potomitsya under the lid for another 5 minutes. 8. 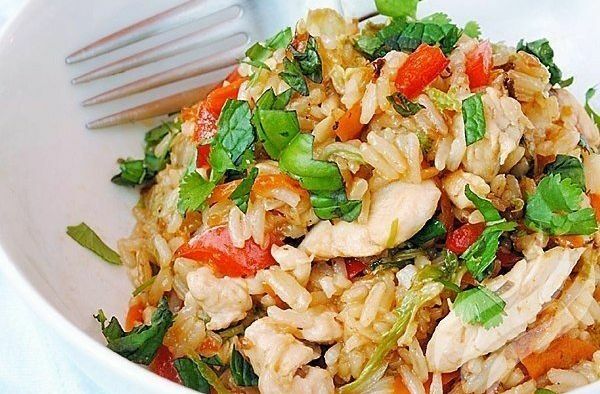 Place the rice in a bowl, add the filling of chicken and carrots, mix thoroughly.